I can't think of a better reason to be a little tired today than staying up for last night's ArtLuck. Do you know what a blessing it is to have artists grace your living room, bringing their brightest beauty through your door? To have your kids watch, wide eyed, as a painter reveals his new canvas, or a poet shares her verse? I know that blessing, and I am grateful. I'm grateful for the 20 people who joined me last night for what may be the last ArtLuck we host in my living room. My family will miss hosting as we move to our new space, but what a finale. For those who couldn't make it out for our ArtLuck, those who want to delve deeper into what was shared, and for the curious, here are 13 moments from our November 13 ArtLuck. At 6:25, before anyone arrives, the house is warm. Ready. Quiet before the beautiful noise. There is something about that moment, waiting for friends and strangers to arrive. You don't know who will come, or when they will arrive. At an ArtLuck, you hope there will be enough food, and enough art, to go around. Wenda is first to present. No stranger to the Bleeding Heart Art Space, Wenda Salomons has shared her ethereal pinhole photos, and charming Instagrams, with us before. On this night, she begins our evening with two blessings written by John O'Donohue. You can find his book, To Bless The Space Between Us, at the EPL here. We were indeed blessed. A perfect way to begin our evening. Next up was a newcomer to the ArtLuck scene, but an old friend of Bleeding Heart and Alberta Avenue. Photographer Rebecca Lippiat has strayed from her more commercial photography work for a series of well-planned images focusing on menacing red figures. As we pass the lap-top around, these evocative images draw out varied feelings and associations, which makes for great conversation. Edward Van Vliet, in classic Edward style, is armed and dangerous with art references. He points out a resonance with the work of Joel Peter Witkin. His work is certainly fantastical, and very well executed. His images are often also difficult to digest and controversial. I am reminded of some works by Fritz Liedkl I saw at the Glen Workshop two summers ago. Edward himself is up next, with 3 new poems. It's exciting to hear Edward's recent surge of poetry. While I cannot play any audio for you here (because I have none), I can share, with Edward's permission, his new poem "Forgiveness"
yours was the better bargain. all i felt was surprise. Marcie is a flurry of thoughts, inspiration and emotion, as she shares where her art and her heart have been leading her lately. She shows us some beautiful books, including I Saw a Peacock With a Fiery Tail. She also reads a gorgeous passage to us from The Rest of The Earth by William Haywood Henderson. Marcie's own piece is in a new style - fine-point drawing in black and white covers the matte, while bright, bold colours splash in similar, but less controlled, watercolour patterns within. We all love this piece, which captures Marcie's passion for creativity perfectly. Erin and Megan from Hope Mission's Tegler Youth Centre are with us tonight. They share opportunities for artists to impact the lives of kids with limited access to art inspiration, education and materials. Even with that limited access, these kids are showing their talent, as we see from sample works Erin and Megan pass around. These talented, creative kids are looking for mentors. Perhaps you can help? If you have a creative gift you'd like to share with a small group of kids who need positive influences and opportunities, contact Megan (for elementary age kids) or Erin (for youth). You can find more information on our site here. Jared Robinson is a fitting follow to the art of the Hope kids, because his work has such joy and youthful energy. And a squid. Jared's new painting is awesome, with wit and layered meaning. He presents a very strong visual that we all want to see painted large on a wall somewhere. Anyone need a mural? Send this guy a challenge! Michelle has so many creative interests, and is always looking to experiment, grow and have fun making art. She is most often a writer of poetry and fantasy, but tonight she brings us a drawing made at, and of, the Alberta Legislature. Or more specifically, two columns framing a portion of the grounds. Not able to stop her creativity for even an evening, Michelle also snaps photos on her new camera throughout the night. You can hear Michelle read her poetry on her podcast, The King's Poetry, on Soundcloud. Our youngest ArtLuck participant of the night (but not our youngest ever), is Quetzal. Attending with his mom (up next), Quetzal shows a drawing he has done of a 'Mech', which, he explains, is a type of robot that people wear to give them extra abilities. The drawing is pretty awesome. Perhaps Quetzal has a drawing-enhancing Mech of his own? Penny, new to our ArtLucks, brings two very different works to show. One was extremely tactile - with dozens of small plastic creatures fused to the canvas in bright ordered chaos. It reminds me of the work of Chris Millar. The other is a painting of a bird with a wily eye, full of expression and mystery. You can discover more of Penny's work on her website at http://eloovias.wordpress.com. Dan brings us back to the raw power of language with his two poems. We note how closely Dan knits spirituality with the body. There is no division between the spiritual the physical in his poems. Edward Van Vliet is reminded of the metaphysical poets, like John Donne. He is also reminded of Leonard Cohen, and any time the spirit meets the sensuality of the body, how can anyone not be reminded of Cohen? There is another author in our midst, and this one can also dance the tango. We don't get a tango demonstration from Aydan Dunnigan, but discovered that Aydan's work also traverses the territory between body and spirit. Aydan tells us a bit about his journey out of a dark, shameful view of the body and sensuality, discovering a way to dance towards hope. 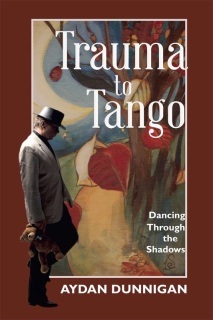 I am intrigued, and more so when Aydan reads from his book Trauma to Tango. The writing is tight and engaging. Funny and relatable. Thankfully, Aydan is ready with copies to sell. I buy one, and intend to dive into Aydan's story very soon. You can get your copy at http://www.traumatotango.com. I'm fairly certain that Adam Tenove has been to more ArtLuck's than anyone. Each visit from Adam brings new work, exploring new territory. And a new culinary experiment. Thankfully, Adam's experiments turn out very well. This ArtLuck offering (in addition to cookie pizza), is a new painting in a series. These works explore still, abandoned Edmonton spaces. This space, an immediately recognizable LRT tunnel, gains new significance through the care and attention of Adam's brush. There is a long conversation about whether or not we want to see people or action in the scene, and why that is. Adam asks for feedback, as the piece is not done. He gets that, and I look forward to seeing the end result. You can discover Adam's work, and his writing about art, at http://ellipsisartcollective.com. And there you have it. Another fantastic ArtLuck in 13 moments. Let's do it again in the new year, shall we?